It was a shocking discovery. On July 2, agents from the Ecuadorian military and police, acting on a tip from the U.S. Drug Enforcement Agency, raided a smugglers' camp deep in Ecuador's jungle. 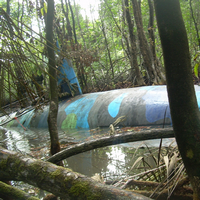 Among rickety buildings and some scattered equipment lay a 100-foot-long submarine, half-submerged in a muddy channel.